According to two reports at the end of July, Motorola has been given approval to make the next Nexus phone, a 5.9-inch whale codenamed “Shamu.” Since the Android world has begged for years to have Motorola make a Nexus, you can imagine that the hypebeast engine has been kicked into overdrive. And when I say “overdrive,” I mean that any potential sighting of the device means people are going to get excited, freak out, and then want to share it with the world, even if it looks highly questionable. And that’s exactly what we have thanks to benchmarks spotted over the last couple of days that allegedly out the device’s specs. A benchmark at GFXBench got this whole thing started yesterday when a device under the name “Motorola Shamu (Google Nexus 6? )” showed up. If the question mark in the name doesn’t scream “questionable” and “WTF? Since when do benchmarks have question marks in their names?” then feel free to proceed. If there is any chance that this is really the Motorola “Shamu,” then this is what GFXBench says about it. The device is running Android L, which would make sense since this will be the reference device and launch partner for the new version of Android. This phone apparently has a 5.2-inch QHD display, with a resolution of 2560×1440. Wait, isn’t “Shamu” supposed to symbolize the fact that the phone is going to be oversized? Remember, two reports both stated that the phone would be oversized, or a “phablet,” with one even saying specifically to expect it to be around 5.9-inches. Yet, GFXBench says 5.2. Moving on. 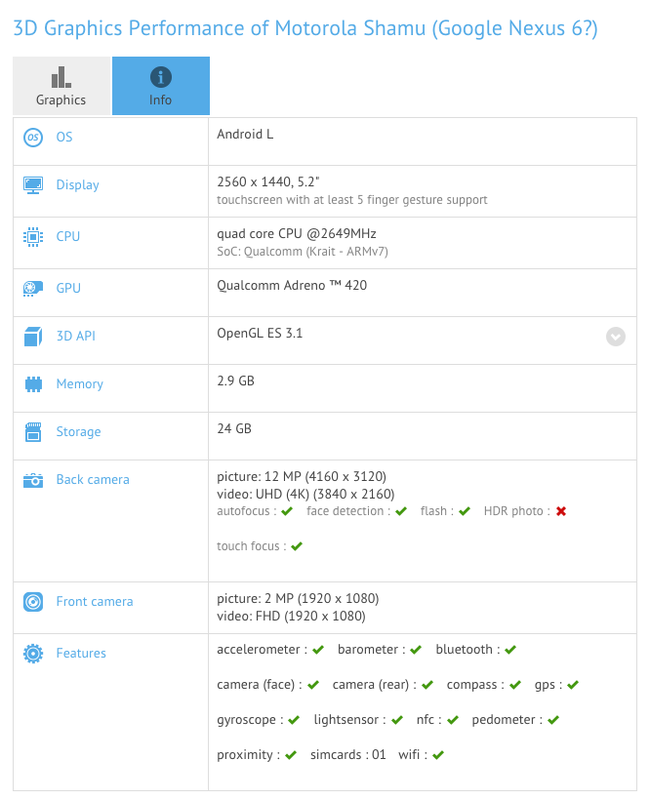 The device listed here has a Snapdragon 805 processor, clocked at 2.65GHz with an Adreno 420 GPU. It also has 3GB RAM, 24GB of available storage (likely 32GB total), 12MP rear camera, 2MP front camera, and your typical sensors. To add to the story, an AnTuTu benchmark also showed up this week with a device named “Google shamu,” that has the exact same specs, but differs slightly with a 13MP camera. The whole situation is very confusing, but hey, this is what we have thus far. Oh, here is how the “Motorola Shamu (Google Nexus 6? )” measures up to the competition in at least one benchmark.